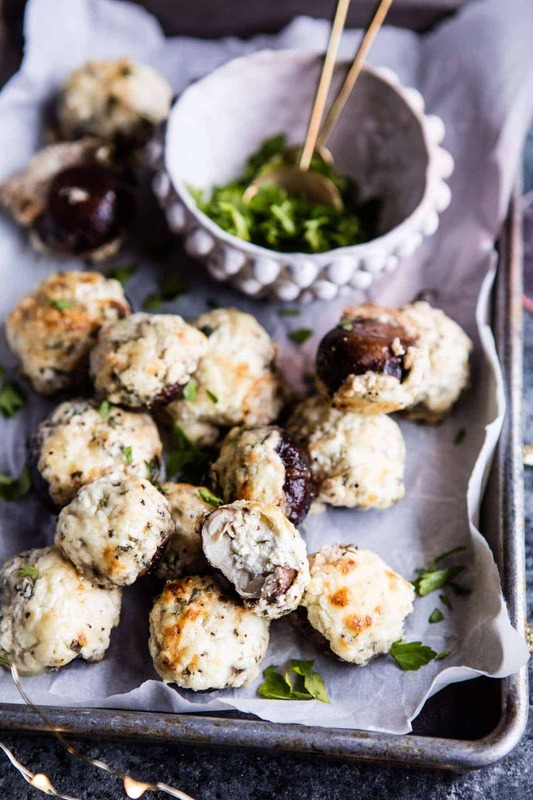 Herbed Goat Cheese Stuffed Mushrooms. 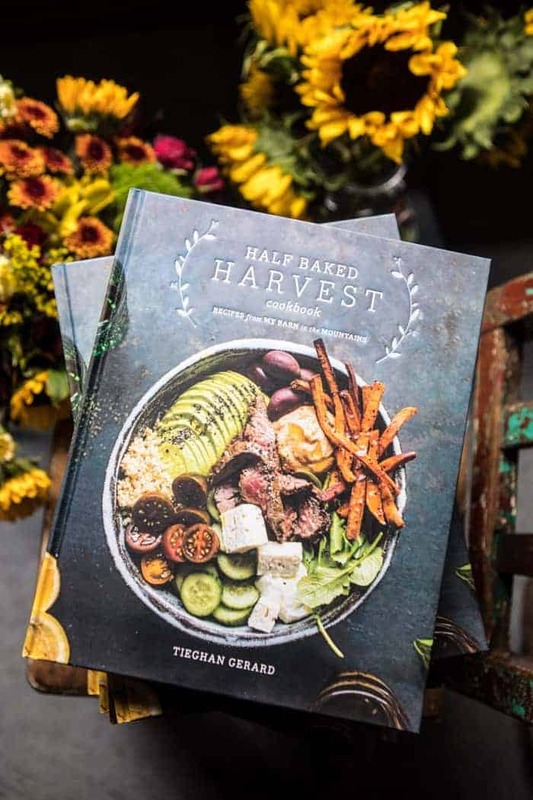 Hey hi, we have cheesy-veggie things to talk about today! Stopping in for a quick post today to share these EASY stuffed mushrooms. I absolutely love these mushrooms, as did my family. My go-to recipe idea girl, Lyndsie, suggested that I make stuffed mushrooms for New Years and I was all about it. Plus, I had a surplus of goat cheese on hand that I knew would make for the most perfect filling. I’m just going to go out and say it…these are addicting, and if you make them for New Years I highly suggest that you double the recipe…these go FAST. Like I said, they’re so easy, just mix up some goat cheese, fontina cheese, parmesan, and a generous amount of fresh herbs. Then stuff it all in some cremini mushrooms and bake. 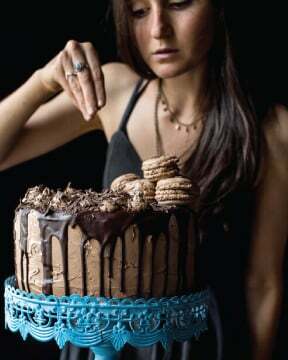 Could not be easier and you can totally stuff the mushrooms in advance and bake before serving. They make for the perfect New Year’s Eve appetizer or snack…which we will be needing many of both in my house. The new group of visitors arrives today so, let the craziness continue. I am really trying to do my best to soak up all the family time and be in the moment. It’s not the easiest for me, as you may have guessed, I am a workaholic. But I had so much fun on our day of snowmobiling and again snowboarding in the backyard with my brothers and little sister on Christmas, so I’m hoping to spend at least one more full day with everyone before the holidays are over. I know that Red and Kai are dying to take me up on the hill snowboarding (like the real hill, not the backyard) and I promised Cait, Kai’s girlfriend, that I’d go with her, so I’ll have to make that happen this week for sure. 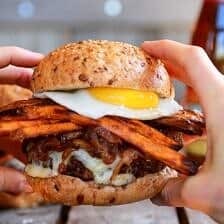 Get excited, they are delish, fun and easy! So what are you guys up to this week? Any New Years plans? 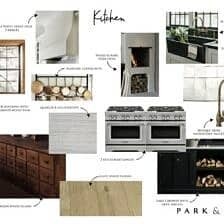 I’m planning to share a couple more recipes this week, as well as a fun round-up post, so be sure to check back for those! 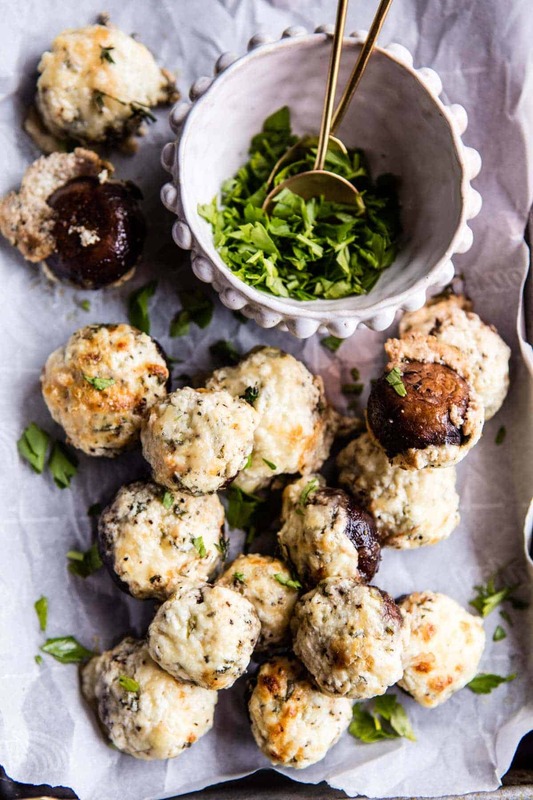 OKOK, and when planning your New Year’s menu, just be sure that these herbed goat cheese stuffed mushrooms are on it. 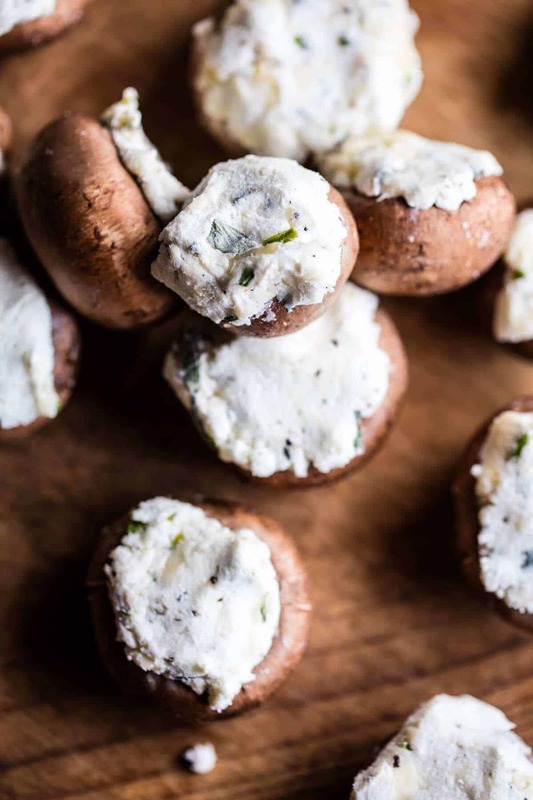 I LOVE using the goat cheese in place of cream cheese that’s most typically used when stuffing mushrooms. 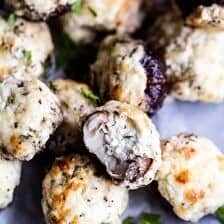 These are maybe the best stuffed mushrooms ever, the cheese and herb pairing is perfection, and I’m thinking that most of you out there really do need them in you life. Perfect way to send off 2016 and welcome in 2017 if you ask me!! A quick and easy party nibble! In a medium bowl, mix together the goat cheese, 1/2 cup fontina cheese, parmesan cheese, thyme, sage, chives, and a good pinch of both salt and pepper. 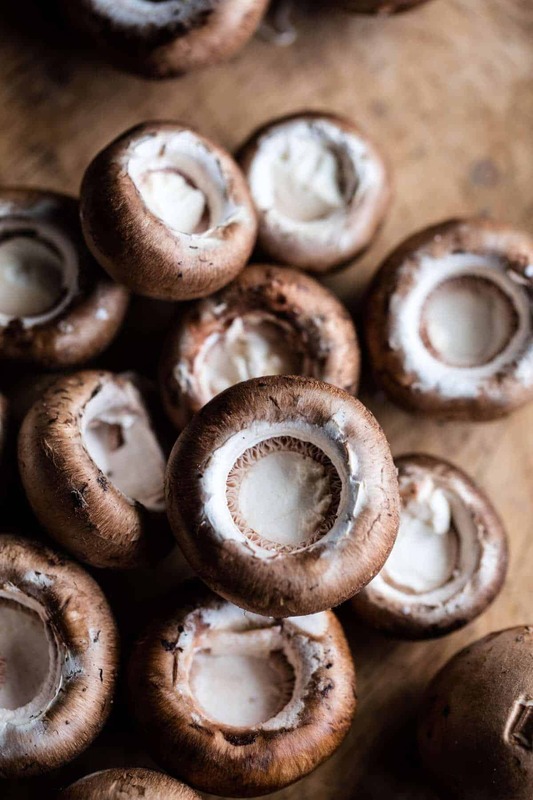 Remove the stems from the mushrooms and spoon the mixture into each mushroom cap, place on a baking sheet. Top with the remaining 1/2 cup fontina cheese. Transfer to the oven and bake for 20 to 25 minutes or until hot and bubbly. Serve warm! PS. I like to double stuff my mushrooms…the more cheese the better! Yes, please! Spicy Fontina Spinach, Artichoke and Chorizo Stuffed Mushrooms. 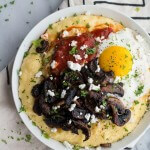 Polenta with Caramelized Mushrooms, Marinara + Fried Eggs and Goat Cheese. 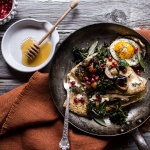 Buttered Hazelnut Crepes with Caramelized Wild Mushrooms, Kale and Goat Cheese. 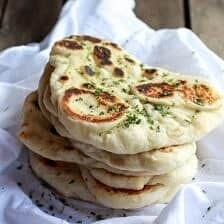 Delicious and simple, these look great! Thank you Rhian! I hope you love them! Haha yes a good sign for a healthy New Year!! Thank you so much Marisa, I hope you love these! 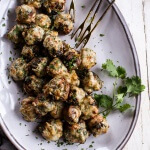 I wish I liked mushrooms because so many recipes call for them–but I can’t–ugh. Now that pasta dish yesterday –I’m for sure making that. Well I hope you love the pasta dish Nancy!! Thank you! Omg, these sound incred and they look even better! My mom was already planning some stuffed mushrooms for our New Year’s menu so she’s gonna love this recipe. So happening, thanks T! Perfect!! I hope you and your family loves these Tori! Thank you! 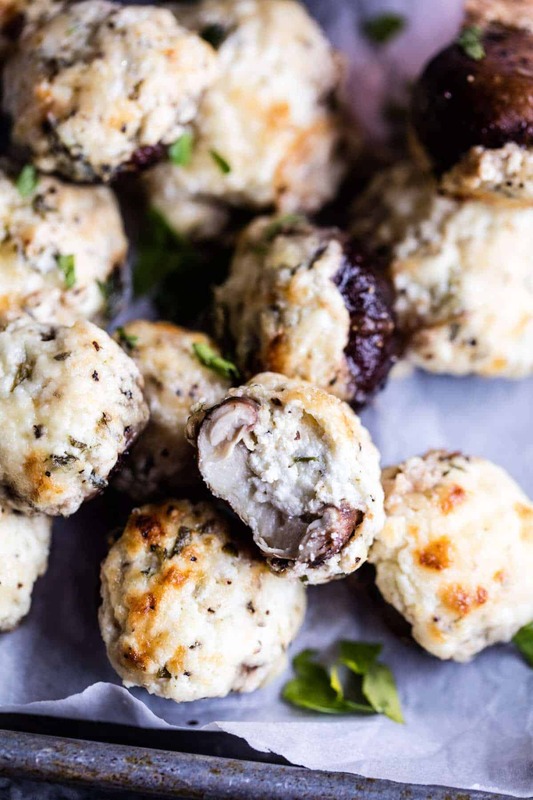 I love stuffed mushrooms and goat cheese and your recipe looks great. I am cooking a New Years Dinner with some friends and your stuffed mushrooms would make a great appetizer. They would make a great appetizer for you and your friends! I hope you love them, Gerlinde! Thank you! Thanks so much Sarah! My Christmas was awesome, I hope yours was good as well!! OMG my partner would kiss my feet if I made these for him. And other things. Now I’m trying to think of all the other recipes I could manage to replace cream cheese with the soft goat variety. 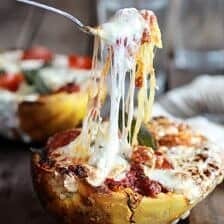 Could I also use parm on top? Hey Stacy! Yes! Still use the parmesan, that will be great! 🙂 Hope you love these! I’d like to take this opportunity to thank you for all the recipes you have given us this year. Very much appreciated. Hi! You can make these 2-3 days in advance. I have never tried freezing them, but I am not sure how the goat cheese would hold up. I have not tried, so I just can’t say. Let me know if you have other questions. Hope you love these and thank you so much for the kind words. Have a great New Year! Definitely my kind of mushrooms! Hmm these look so goot! Haha! I love reading all your comments today! Thanks so much again!! Happy new years! I am so glad you loved these! Thank you Liz! 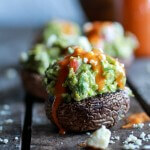 Stuffed mushrooms are the best, these look fab!! They are seriously so delish!! Thank you Laura! Is that suppose to be 1 ounce of goat cheese or 6-8 ounces of goat cheese? These look fantastic! I was also wondering how many ounces of goat cheese you were trying to specify?